You will either hear ‘breakfast pizza’ and think it is the best idea anybody has ever suggested or will absolutely hate the idea and think it doesn’t work at all. We can confirm: it really does work. And it is delicious. The fact that it is healthy is even better news. All the joys of a pizza, but without the calories and the over-full feeling afterwards. Even the dough base is healthy, using Greek yoghurt. The choice of toppings is endless and can be completely adapted to suit your usual breakfast diet. For this recipe, we used bacon, mozzarella cheese, mushrooms and an egg, but you could also use peppers, onions, avocado or any leftover veggies from the night before. You can even make it in to a Full English breakfast pizza with sausage, tomato and black pudding if that is more your style. 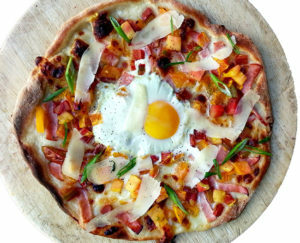 Breakfast pizzas are perfect for those lazy weekend mornings where the weather is nice enough to sit outside all day. Or maybe you’re feeling a bit worse for wear and need something more substantial and ‘dinner-like’ than a bowl of cereal. Just fire up your outdoor wood-fired pizza oven, and the pizzas will be cooked in no time. This recipe makes four small personal pizzas. If you prefer to have your egg well-done, gently break it on before it goes in the pizza oven for around 10 minutes. See? Easy. And they are all ingredients and toppings perfectly suitable for breakfast time too, so it will feel completely normal.